MLB Territories in Virginia and Maryland | Should you root for the Nationals or the Orioles? In my previous post, I made a map dividing the entire United States in to 30 Major League Baseball Territories. The idea was that this map would help you choose which team to root for based on which stadium was closest to where you lived. 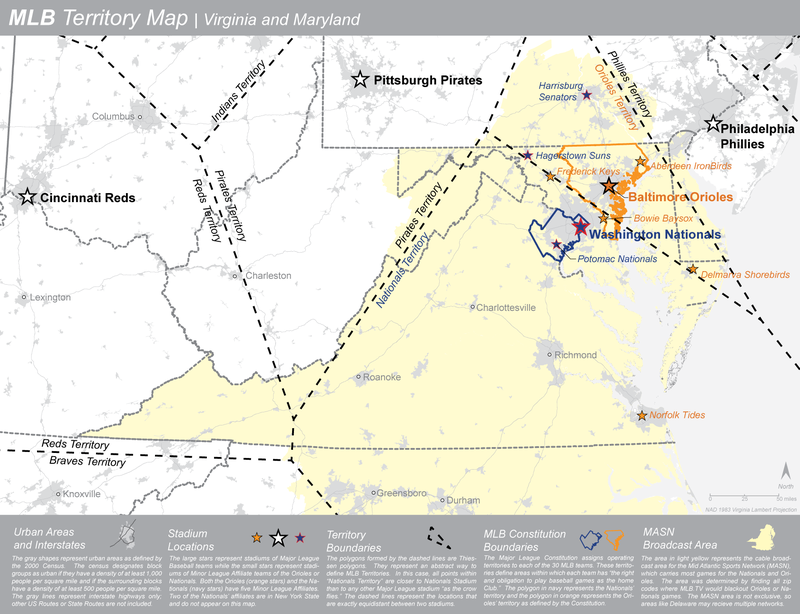 In part 2 of my mini research project, I zoom in on the “hotly” contested territories of Virginia and Maryland. Many Virginians and Washingtonians around my age grew up rooting for the Baltimore Orioles because they were the closest MLB team. But in 2005, the Montreal Expos moved to Washington D.C. where they became the Washington Nationals. Baseball fans from Virginia and DC had a decision to make – should they honor their allegiance to the Orioles, or abandon their old team because the Nationals were in town. If the locals didn’t root for the Nationals, then who would? To help answer this question, I made a map that just focused on Virginia and Maryland. Besides showing the closest MLB stadium, I also included a few other pieces of information that might help someone decide which team to root for. For example, I’ve included the locations of all the Orioles and Nationals minor league affiliates (if you live close to one of those teams it may affect your MLB allegiance), and also included the official territory as defined in the MLB constitution (yes they actually have a constitution). Just for kicks, I also included the area covered by MASN TV network that shows both Orioles and Nationals games. This was actually the most time-consuming part of the map making process because MASN doesn’t release this information. Instead I used MLB.TV’s website, and typed in every zip code to see if Orioles’ or Nationals’ games were “blacked out.” If you live in a zip code where you couldn’t watch an O’s or Nats game on MLB.TV, I assumed it was because your zip code gets the MASN network and MLB.TV is not allowed to steal any of MASN’s potential viewers. As always, just post a comment if you are curious about anything! 3 Responses to MLB Territories in Virginia and Maryland | Should you root for the Nationals or the Orioles? Can’t wait what you have in store for us next.